Explore the CDW•G solutions and Apple products that make your work life easier for you. Apple’s software platforms — iOS®, macOS®, watchOS® and tvOS® — provide seamless experiences across all Apple devices and breakthrough services including the App Store®, Apple Music®, Apple Pay® and iCloud®. CDW is an authorized reseller for higher education. Call 800.800.4329, or contact your account manager for more information. Empower Employees to do their best work. When employees work with products that feel familiar and operate intuitively, like iPad and Mac, they can accomplish tasks faster and more efficiently, so they can do their best work. 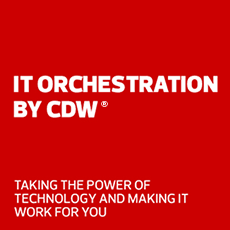 Learn how CDW and Apple can change the way your business operates. With great performance, a portable design, and the productivity features in iOS, iPad lets you get to work, wherever you go. No matter which Mac you choose, you get incredible performance and capability with Apple's most advanced OS — all so you can do your best work. Need to shift your business into high gear? Time to consider the Mac®. It gives you the tools you need to make your business stand out and stay productive, the security to keep your business safe and the compatibility to fit right in with your current technology investments. Jamf explains why you should implement an Apple choice program that will delight your employees. Let CDW help you lease an iPad or Mac while staying within your budget. Apple, the Apple logo, Apple Music, Apple Pay, Apple Pencil, Apple TV, Apple Watch, iMac, iMac Pro, iPad, iPad Pro, iPhone, iPod, iTunes, Mac, MacBook, MacBook Air, MacBook Pro, Mac mini, macOS, Mac Pro, Retina, and watchOS are trademarks of Apple Inc., registered in the U.S. and other countries. Multi-Touch, Touch Bar, and tvOS are trademarks of Apple Inc. App Store, AppleCare, iCloud, and iTunes Store are service marks of Apple Inc., registered in the U.S. and other countries. IOS is a trademark or registered trademark of Cisco in the U.S. and other countries and is used under license.